I'm very excited to go to a media-only event tonight, and I'm WAY over the top bursting with yippy-yay-yo happiness!! 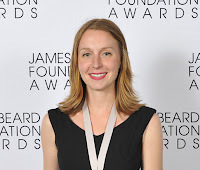 It's the CHOCOLATE ADVENTURE CONTEST: Sandwich Cookie Edition -and I get to see Christina Tosi, James Beard Rising Star Chef 2012, as it is hosted in Brooklyn at Momofuku Milkbar. All of the featured items in tonight's culinary treats contain Scharffen Berger. It all comes down to this: Chocolate + Milkbar = Blissfulness as I slip into a choco-coma....! I'll also be live-tweeting (@NYCfoodieblog) and sharing photos from the event. If they share recipe secrets, look for that on NYC Foodie Girl, too! You might even get a chance to hear a podcast later this week, if I can get an interview score with Christina. If you have any questions for her, let me know! I'll ask!